Bob King, the former organizing director and now president of the UAW, has now made it clear that after years of failing to organize any of the transplants that he is staking the flag, and perhaps the future of the once great and now shrunken, 400000-member union, on potential success at the Nissan plant at Canton. None of this comes as a surprise to me, having had conversations off-and-on as long as 4 and 5 years ago about how a community-labor coalition could be built to support an effort in Mississippi, but the campaign has clearly now entered a new public and strategic stage which brings the organizing drive past speculation and planning to a much more serious place fraught with both risk and potential. A former ACORN leader, Sarah Dave, living in the Jackson area had gone “old school” and sent a copy of the July 18th edition of the Jackson Free Press by US mail with a long, front page piece by Joe Atkins entitled Operation Dixie: The Battle to Unionize Nissan so we knew what was happening in Canton. Atkins’ piece is a strong, well reported sympathetic piece that set the stage for the coming fight. Reading the story as an organizer though was a frightening, worrisome experience. These are the “rollout” stories where the stage is set, which might be seen as the “honeymoon” phase of the campaign for the UAW drive, before the campaign is fully engaged. 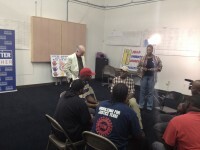 Atkins reports on a meeting in Canton where the UAW had brought in the star power of Hollywood’s Danny Glover, accompanied curiously by Bruce Raynor, the old ACTWU, UNITE, and now SEIU’s Workers’ United president emeritus, as a southern organizing “expert.” Atkins says there were six people who met with Glover and Raynor. Ouch! That can’t be the number of workers that UAW organizers had hoped to draw for such a high profile, press covered, dog-and-pony show! The workers interviewed seemed solid, if not inspired, while the union seems to be searching for the issues that might ignite the campaign and trying out wage disparities with other plants, wage freezes, and the threat of temporary workers (there are about 800 in the plant now) to see if something might catch fire. Glover seems to have spent a lot of time trying to rekindle the long banked fires of the civil rights movement to see if there was a spark there that might fuel the drive. In a workforce that is 80% African-American with jobs allowing them to make between $45000 and $60,000 (including 5 hours of “scheduled” overtime according to a Reuters report from July 31st on the UAW effort) which in this recession economy draws a workforce like a magnet to Canton from a 90-mile driving radius, waving the bloody shirt of the civil rights movement is not going to be enough to move the card signing and deepen the support of the workforce. If a vote in Canton were held today, the UAW would surely lose, according to more than a dozen workers and labor experts interviewed by Reuters. But pro-union workers say the union would have a better chance of evening the odds if it were allowed to talk directly to workers. The UAW has successfully organized Southern plants operated by auto parts suppliers Johnson Controls Inc (JCI.N) and Dana Holding Corp (DAN.N) when allowed to speak directly to workers unencumbered by the companies. The union has started to apply public pressure on Nissan to open its doors. On June 3, local politicians and religious leaders joined the UAW at a workers’ rally in Canton attended by 250 to 300 people, by UAW count. The UAW is also creating a planned “monitoring committee” of nationally known politicians and celebrities. The committee members, who will soon be announced, will call on Nissan to give the UAW equal time, Casteel said. Getting Nissan to agree to a basic set of principles — including remaining neutral during a union drive — is the first task for UAW organizers, and, according to labor analysts, it is a long shot. “We almost always win when the employer expresses true neutrality,” said the UAW’s [Gary] Casteel. Of course, Casteel’s point about the likelihood of a UAW victory, if labor’s holy grail of “true neutrality” is achieved, is exactly why the chances of this strategy working and winning are somewhat the same as a snowball’s chances of not melting in Mississippi in August. This entry was posted in Labor Organizing and tagged Caton, Mississippi, Nissan plant, UAW by Wade. Bookmark the permalink. Having worked at Nissan’s Smyrna plant for 26 years before retiring and watching technicians vote down the UAW twice by better than 2 – 1 margins, I can say the UAW will fare no better in Canton. That’s because Nissan gives workers excellent pay, benefits and working environment. Plus workers have real input through teamwork on making improvements … making tasks safer, more efficient, and improving quality. In short, there is nothing to be gained and lots of monthly dues to be paid. Empowering union sloths is like voluntarily inserting your private parts in a vise grip. They’ve collapsed the cities up north and now have right to work states in their sites. Filthy union slime make terrific magicians. Unionize and watch your jobs disappear. MS needs to tell the UAW honchos who are running out of gas to get out of their vehicles and take a hike in traffic. Toyota is relocating its national HQ from CA to TX because of excessive operating costs and taking 40,000 jobs with it. Watch and learn how taxes and unemployment skyrocket in heavily unionized states.